Rollo is fully compatible with USPS labels generated through eBay. We just need to tell eBay to print in 4 x 6 format. Note: After you follow these steps, only your new labels will be generated in 4 x 6 format. eBay will not change your previously printed labels. Currently eBay provides 4 x 6 labels only for USPS shipments. Note to IE users: Please note Rollo users have reported an occasional bug on eBay with Internet Explorer / Microsoft Edge. If you click Print and nothing happens, please close your browser and open it again or use Chrome or FireFox. Please note this is unrelated to Rollo and it has to do with Internet Explorer and eBay. Note to Safari users: Safari adds a white margin around the label which cannot be removed. We recommend that you use Chrome. It can be downloaded for free here. On the new eBay Interface, please 4"x6" PDF as your label format. On the following pop up, you may pick any of the 4x6 label sized printers. 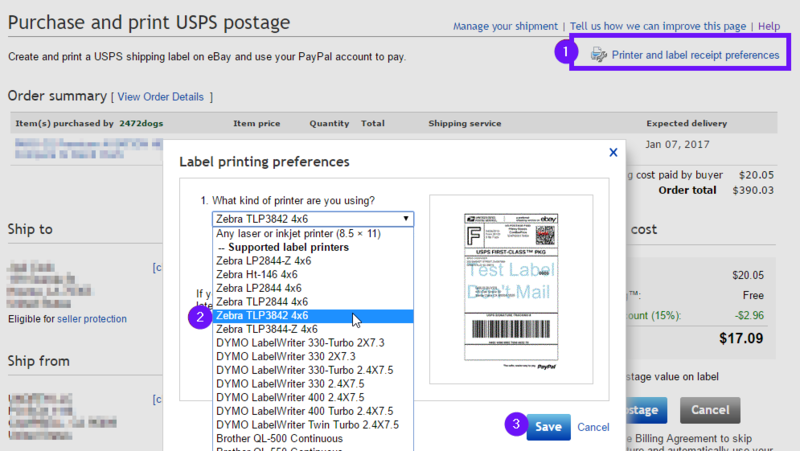 For example, you may pick the "Zebra TLP3842 4x6"
Click "Save" and continue with the purchasing of your label.